Randall “Randy” Frederick is a full-time, Field Training Officer and EMT. Randy began his career at North East Mobile Health Services (NEMHS) as a wheelchair van operator. 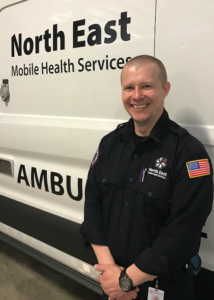 Randy found his calling and became an EMT, a role he has filled admirably for the last four years. Randy was quickly promoted to a Field Training Officer, where he has excelled and provided knowledge and guidance to many of our newer employees. Randy is the person you would want to take care of you. Randy has a certain calmness, and connection to people that conveys, “It’s going to be OK,” without saying a word. One of our most-praised Field Training Officers, Randy is compassionate, kind, and has a talent for providing guidance and encouragement to new employees. Recent evaluations of Randy by his trainees feature positive comments that he is “knowledgable,” “unbelievably patient,” and “made me feel welcome and was always encouraging”. Randy was also described as “one heck of a nice guy”.